The simulation environment takes a standard C program, translates it to an MPI-C program, then compiles, links, and runs it using MPICH2. MPI, or Message Passing Interface, is a widely used parallel programming model. In using this model, the programmer explicitly defines the parallel tasks or processes as well as the communication among them. MPICH2 is an open-source implementation of the MPI standard. 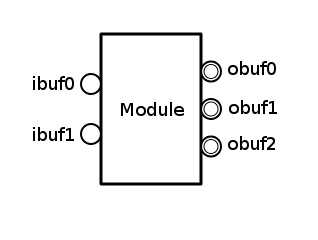 The script c2mod.py identifies the processes in the C program and determines the number of input and output communication ports associated with each process. The user defines the connections among the processes using the AsAP Mapping Tool and saves this information in an XML file. The script runptsim.py uses this XML file and inserts the necessary MPI subroutine calls to enable communication between processes. The MPI-C program is then compiled, linked, and run using MPICH2. Make sure you are logged into pepper. 3. NOTE: You must be consistent in naming your files. 5. Create a new file in your text editor and name it myparallelprog_input.dat. Each function you write will be converted into a module (block) by c2mod.py. between your functions by reference. Nothing in AsAP is 'global', therefore global variables have no analog. Thus, all #define lines must be removed and those variables declared within the functions which use those values. Your modules will not be 'called' individually, they will (by definition) be running concurrently. You may be trying to load data from a file for your memory, but that is not allowed. You will need to initialize your array manually when you declare it. for you so that you can just copy and paste it into your .c program. The script c2mod.py will not interpret block comments (/* code */) properly. The MPI simulator allows printf() statements, which can be used for debugging. First save inputs to a temporary variable. Otherwise, your program may enter an infinite loop. MPIDI_CH3_PktHandler_EagerSend(606): Failed to allocate memory for an unexpected message. 261895 unexpected messages queued. The error can occur even after running runptsim.py several times. This is NOT an error with your code. stored in the internal buffer and eventually the buffer runs out of memory. For more information, refer to: Argonne MPICH2 Wiki. If all else fails, insert printf() statements in your code and redirect output to a file.